When recent University of Vermont alum Alex Poniz heard there were five internship openings on the Digital Products team at Tesla, the Silicon Valley electric car maker where he works, he knew just what to do – contact his alma mater and get as many Catamounts in the running as possible. Poniz, a quality assurance engineer at the company, is a serious fan of UVM, but even he was surprised at the outcome. Resumes for the positions flowed into Tesla from around the county, including – thanks to Poniz – eight from UVM. When the dust had settled, more than half the positions – three of the five – had gone to UVM Computer Science majors. What was it about the UVM candidates that Tesla brass found so compelling? Poniz – who had no role in the hiring decisions – says a number of factors were at work. First, UVM’s Computer Science curriculum had given the students a rock solid foundation. “They had the baseline of skills that we were looking for; facility in the programming languages, tools and technologies that are important to be able to hit the ground running at Tesla,” he says. UVM junior Luke Potasiewicz, one of the students selected, had built an electric bicycle between high school and college, for instance, which he used to commute to work and then to tool around campus. “People thought that was pretty cool,” Poniz says. And there was something else: the UVM applicants had a world view that meshed with the culture of Tesla – which manufactures and sells solar panels, as well as electric cars. To be precise, the Tesla placements are co-ops, six-month work experiences that happen during the school year and pay comparably to an entry-level position. The growing co-op program in UVM’s College of Engineering and Mathematical Sciences, which Tesla is part of, complements the many internships UVM also offers, which are shorter and typically occur over the summer. Poniz, a mechanical engineering major at UVM who has worked at Tesla for two years, was eager to connect UVM students with Tesla because he knew the co-op would provide a rich learning experience. Getting an insider’s view of Tesla has been an eye-opener for junior Gordon McMaster, who’s writing code for the Tesla website and customer kiosks in dealerships. “I was put on two projects that were just starting, so I’ve talked to a lot of different teams and been able to see all the different parts of what goes into getting a project off the ground,” he says. It's both complex and impressive, he said. Potasiewicz is writing software for the Tesla phone app, working alongside some of those world-class software engineers. They’ve taught him an unexpected lesson: that even software gurus with years of experience in Silicon Valley don’t have all the answers. “It’s interesting to see them be so good at something and then Google something else because they don't know what it is,” an insight that’s given him the confidence to ask questions as he does his own work. Junior Sam Frederick, who writes post-purchase software that helps the company find just the car the customer ordered online and makes sure it's delivered on time, expects the Tesla co-op will pay major dividends – academically as well as professionally. “I’ve definitely picked up some skills here that I’m excited to bring back to UVM, because they’re actual software development skills that are used in the workforce,” he says. That will be a boon for the team projects that are big part of the senior year curriculum in the College of Engineering and Mathematical Sciences, he says. 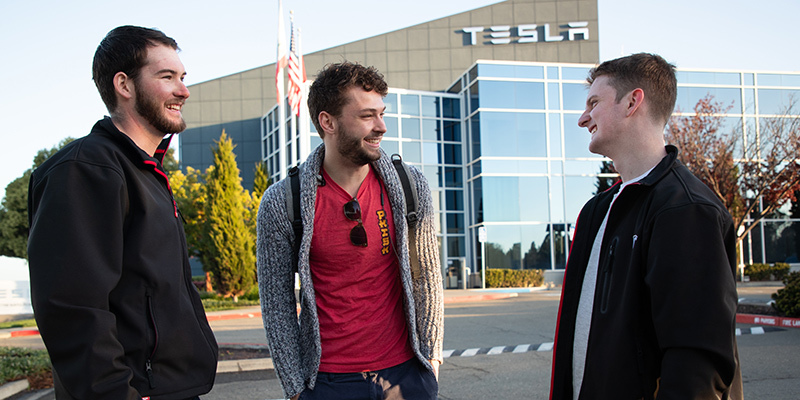 As a resume-builder, the Tesla experience is hard to beat, says Potasiewicz. Students in co-ops more often than not are offered jobs at the end of the experience, says Lauren Petrie, coordinator of the Career Readiness Program in UVM’s College of Engineering and Mathematical Sciences, one reason the school is expanding its commitment to co-ops. Within five years, she expects UVM to have co-op relationships like the one with Tesla with 20 to 30 employers.